Kyle, Congrats for your job. One comment however : if you get the "jobOperator" thru jndi, you will be limited to one remote job. Right ? 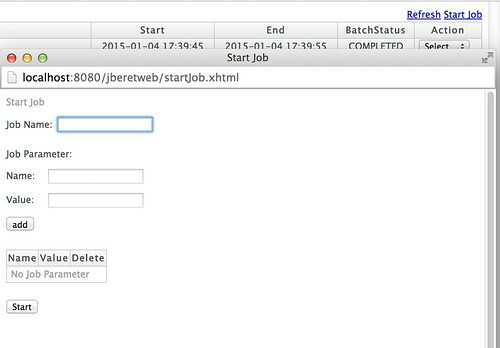 If each application running one (or more ) job registered itself to jberetweb and exposed some kind of API (REST...) to manage its job, jberetweb would be able to restart or stop remote jobs on several hosts. What do you think about this ? Yes, the idea was to be able to deploy new jobs and being able to manage them thru one single console. For the REST API, I thought it would be easier to launch a job without a java client.